MCAS Cherry Point is located in Havelock, North Carolina, about 30 miles from Jacksonville, North Carolina, which houses Marine Corps bases Camp Lejeune and MCAS New River. 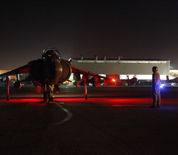 MCAS Cherry Point is home to the 2nd Marine Air Wing and Marine Aircraft Group 14. It is the East Coast home to the AV-8B Harrier, the C-130J Hercules, and the EA-6B Prowler along with several other platforms. This MCAS Cherry Point directory has essential numbers for lodging, commissary, Marine Corps Exchange, medical, dental, pharmacy, movie theater times, fitness center, and more.